Who am I? I am an AAPTard. Someone who has been supporting AAP since the day it was formed – criticizing its wrong policies and supporting its ideology. But wait, people say AAP is nothing but a theater troupe and Arvind Kejriwal is the director of all this drama. Rightly said, after all he has been in the news for the weirdest reasons- dharna, protests, defamation, allegations etc etc and the list is never ending. But why should one support this dramebaaz and be in a politically awkward situation? 1. 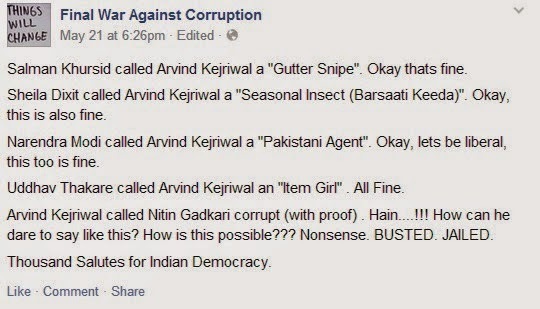 To understand the reason, one should first know who Arvind Kejriwal really is. He was never a politician, he was an activist and it is his mindset that makes him a very strange politician. Activists are supposed to be fearless, aren’t they? What drives Arvind Kejriwal is his past which is full of dharnas and protests against the government. Dig into his past, he has actually managed to tear apart some of the government departments with the same approach. But sadly, he is now a politician and that is where he has failed to transform himself. Activists are ever ready to go to jail, doesn’t he reflect this ‘quality’ as well? 2. The Lokpal Movement- All of us know the face of the movement was Anna Hazare, but who was the actual architect of the movement? It was not Kiran Bedi, it was Arvind Kejriwal. Right after Arvind split away from Anna, the nation got a good-for-nothing toothless Lokpal Bill. It is very simple, Arvind never let Anna compromise on the demands which were set very clearly and till the time they were together, even the government was scared of the Lokpal Bill. Not even a single principle was compromised, much like today. What happened after that, we all know. 3. So Arvind only knows how to sit on dharnas. Yes, that is actually true. Then why did the nation support his dharna in 2011? Was he a saint at that time just because he was sitting with Anna? Okay, let’s go back to the Delhi government days. A girl gets raped, Arvind and other ministers decide not to give the recorded reason Shiela Dikshit played for 15 years- “the police is not under me”. They take up another issue and directly ask the police to take action, not on their orders, but on the requests of people living in Khirki Extension. And what does AAP get out of it? NEGATIVE coverage. Don’t we all pray to see politicians actually being active and asking bureaucrats to be accountable to the people? And then comes the dharna. Yes the way to protest was wrong, but the intention wasn’t. Had he not sat on the dharna, the media would have blasted Kejriwal for repeating Shiela Dikshit’s words. Yes he could have tried other alternatives like asking the home ministry formally to provide special control on the police to the Delhi Government, but we all know that would have taken decades. There just wasn’t any quick solution and eventually, he faltered. 4. AAP only targeted Modi and almost everyone turned against Kejriwal. What people missed was that AAP’s another senior leader, Kumar Vishwas, was contesting against Rahul Gandhi! Does it not clearly show that they were against both the parties? The Congress was already defeated before the elections! It is a very simple logic. If there is a cricket tri-series against Australia and Bangladesh, has India ever treated Bangladesh as its competitor no matter how bad India’s form is? You always compete with someone who is stronger than you, even if the opponent is bound to crush you, much like the 2003 World Cup Final against Australia. 5. The sins of the past are going to haunt AAP forever- the gravest being quitting the Delhi government. Yes, no matter how much one supports AAP, one can not defend the rationale behind this move. Kejriwal was caught in his web of big-mouthed-principles. But the top agenda on AAP’s manifesto was the Lokpal Bill. Had he not quit, the media would have branded him as “Kejriwal- Lokpal pass na hone pe bhi CM”, “Satta ka lalchi”, “Paltu Kejriwal”, “Dhokebaaz Kejriwal” and what not. What was his mistake? Was he corrupt? Did he indulge in scams? Did he not try his best to be a good CM? Weren’t the MLAs of AAP clean and honest? Yes his decision was wrong. But, as Kejriwal says, did he run to Pakistan? He is right here, ready to fight the elections again. Bhagoda, really? Only if AAP had got 26 instead of 28 seats in Delhi, the situation would have been completely different. 6. Yes he did a mistake by jumping into the Lok Sabha elections and he actually paid the price for it. A good price indeed, something that will make them introspect and come up with politically correct strategies, after all that is what the Indian public wants to see- politically correct statements. Fighting against Modi was really the most foolish decision ever. But good for AAP and Kejriwal that he lost. They have finally fallen flat on earth and realized that everything can not be a fairy tale. Time to learn, time to introspect! 7. Did the public of Delhi really vote against AAP? Statistics present a very different picture. Though the vote share of BJP has increased tremendously in Delhi, the vote share of AAP has also increased! That clearly shows that despite the Modi-tsunami, Delhi still voted for AAP in big numbers. But Delhi always votes according to the mood of the nations and so, it was a vote for Modi, not against AAP. 8. AAP was here to change politics. But sadly India does not deserve MPs who want to work for the people. Mhaske, Shefali Misra, HS Phoolka, Dr. Virender Singh, V Balakrishnan, Meera Sanyal, Adarsh Shastri are only some of the names which can inspire anyone to vote for AAP. But no, we will always vote for the corrupt, the criminals and the rapists but never for people who have committed their lives for the welfare of people. Because, Namo Namah, ache din aane wale hai, hum wapis corrupt MPs laane wale hai! AAP won 4 seats. Well that really is a big number considering they were facing a severe financial crunch and had no money to advertise the way BJP did. Their marketing strategies fell flat and whatever publicity they got was through channels like Zee News, Times Now and India TV which clearly were hell bent on ridiculing AAP every single day, every single minute. They should thank AAP for making elections interesting. With such negativity around AAP, even 4 seems to be a big number! 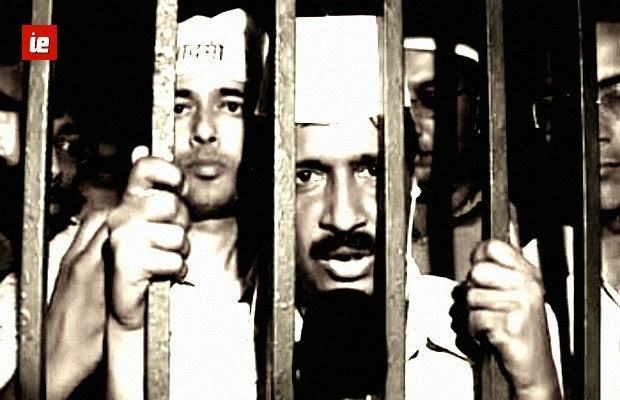 And yet again, while i write this, Kejriwal has decided to stay in jail and not seek bail. Well, this article actually sums it up well. Also, Nitin Gadkari had to step down as the president of BJP due to irregularities in the Purti Group. Someone who had been punished by his own party is fighting a case because he was called corrupt. Remember the mindset of an activist? Take politicians head on, fearlessly? The same Kejriwal refused bail when he was not a politician. He wasn’t famous then and now he is just sticking to the same principles. Is it so difficult for people to understand that everything is not drama? Nobody can deny that he has manipulated a lot of statements, but had he applied for bail, the media would have dug up the old incident and pointed out that Kejriwal has changed, he never paid the bail amount when he was an activist, but now he has paid the bond and CHANGED! He can take another option here. File a case against Gadkari and fight endlessly for years. Well his first preference should be that, but when politicians like A Raja and Kalmadi are roaming around freely, I doubt if this option will EVER work out in the Indian Judicial System. All political parties wanted to defame AAP and dig its coffin right from the day it was formed. Congratulations to all the parties supported by our impartial, unbiased media- YOU HAVE WON. India has lost, not exactly a good government which is a far-fetched dream for AAP, but definitely a very good opposition. To the Indian media, try your best, you will not be able to wipe off AAP so easily because all AAP needs right now is some introspection, reforming its internal structure and focus on inner democracy and here is how they can do it. For if AAP fails, we will never be able trust another party which wants to send clean candidates to the parliament. 1. How is the BJP planning to recover the amount spent on advertising? 2. How many criminals has BJP sent to the parliament? Clearly it wasn’t the candidates of BJP who won, it was Modi who made them win. 3. If BJP really is going to change India, can it first please change all the states it is ruling? 4. Can BJP explain why Karnataka is in a mess even though it ruled the state for a long time? 5. If BJP really is the answer to India’s problems, then why is BJP’s coalition government struggling in Punjab to save its youth from drugs? 6. A dead opposition, will it not lead to dictatorial rule in India? 7. Do all BJP ruled states have 24×7 electricity, good education, health facilities and roads? If not, then how can a BJP govt be trusted to bring sweeping changes in India? Questions are endless, because BJP might be good for India’s economy, but definitely not a good option at the grass root level. No matter who rules the country, it is India which should finally benefit.